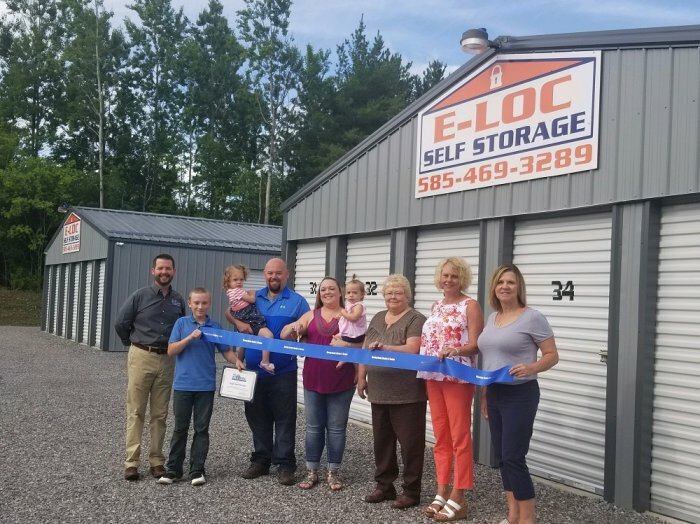 (WARSAW, NY) On Friday, July 27, 2018, the Wyoming County Chamber and Tourism office was pleased to host a ribbon cutting at the newly built E-LOC Self Storage facility in Castile with business owner Jesse and Tristan Cole, supporters and family. The E-LOC Self Storage facility is located at 5682 Route 19A, Castile. The new E-LOC Self Storage facility has two main buildings with 30 units each, totaling 60 available units in four sizes ranging from 5’ x 10’ to 10’ x 20’. E-LOC Self Storage building owner, Jesse Cole, said he saw a need for the personal storage facility in the community, and located it centrally on Route 19A for easy access. Anyone interested in renting space can visit the website: www.elocselfstorage.com and easily secure a space right on the website.